A large-scale, long-term simulation of the hydrogeochemical behaviour of fractured rocks is shown in this post. 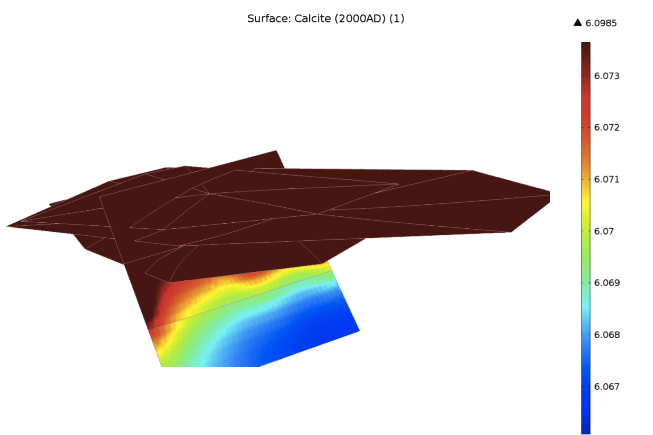 The simulations are performed with iCP, the COMSOL-Phreeqc interface, that allows performing 3D reactive transport simulations in discrete fractures accounting for matrix diffusion (as a 4th dimension). In the framework of safety assessment studies for depth geological disposal of nuclear waste, important scientific efforts are needed in order to understand the feasibility of the planned repositories. This is precisely the case of Olkiluoto in Finland, where the land uplift, related to the withdrawal of ice from the last glacial Age, plays a pivotal role in the hydrogeological patterns of the site. It is thus very important to improve the knowledge about the past evolution of the hydrogeological and geochemical conditions. In fact, as a result of land uplift, the infiltration of meteoric water could have triggered weathering processes, which, in turn, have impact on key parameters controlling the long-term stability of the planned repository (pH and redox conditions, availability of mineral buffers, etc). Furthermore, the presence of sulphate-rich waters along with bacterial communities and substrate might activate microbial mediated sulphate reduction processes with the related generation of, which is a detrimental agent for the copper canisters where the waste is placed. Geographical location of Olkiluoto Island and related fractured system object of simulations. It is shown the initial density field in depth. 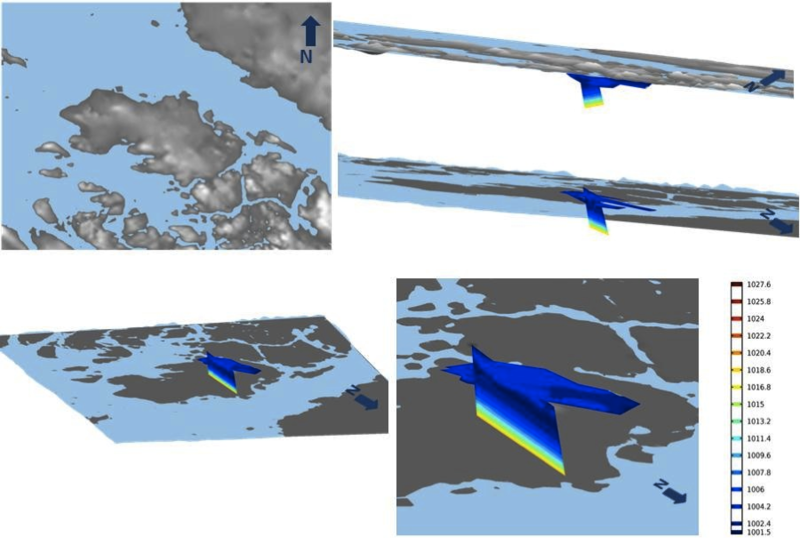 In order to improve the understanding of the effect of the aforementioned events on the current hydrochemical conditions, we have developed a complex three-dimensional palaehydrogeological reactive transport model of the Olkiluoto site. The model consist of four hydrogeological zones of the Well Characterized Area (WCA), namely BFZ100, HZ19A, HZ19B and HZ19C. The Palaeohydrogelogical Reactive Transport (PRT) simulations, which spans 2000 years (from 0AD to present), aim at capturing the mutual interplay of different processes (i.e. land uplift, intrusion of meteoric water, weathering, mixing of waters etc.). 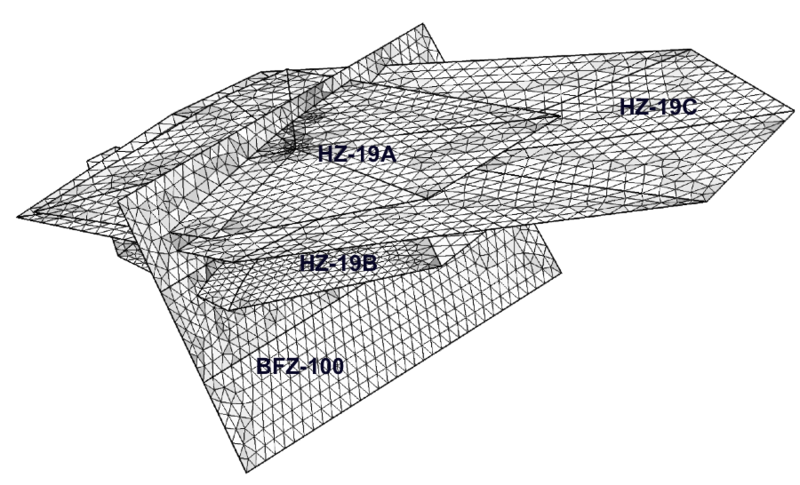 The hydrogeological zones are simulated as two-dimensional planes within a three-dimensional domain. 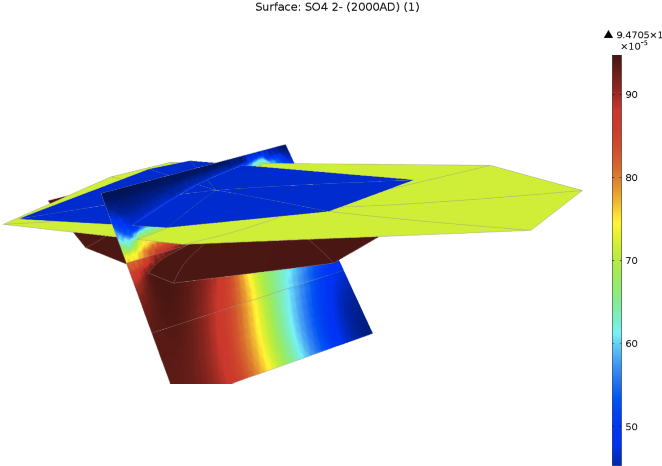 After some preliminary runs, different sets of three-dimensional PRT simulations have been carried out. In each of these simulations the geochemical complexity of the system has been progressively increased by including new processes (e.g. mineral equilibrium → mineral equilibrium and kinetics → mineral equilibrium, mineral kinetics and cation exchange). 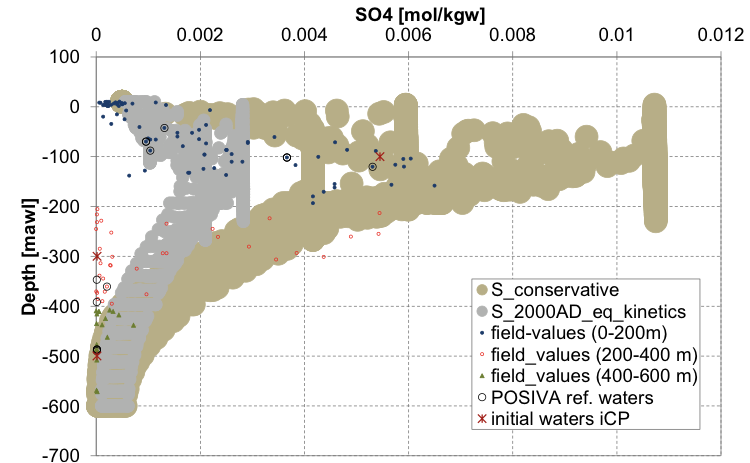 The results of the PRT simulations have been compared with the available field data and the general good agreement of the results has highlighted both the reliability of the model and its potential for the prediction of the future evolution of the geochemical conditions at Olkiluoto. Miguel Luna studied Geological Engineering at the Politechnical University of Catalonia (UPC) and the Geology University of Barcelona (UB). He holds a Master in Numerical Methods for engineering calculation and design at CIMNE (International for Numerical Methods in Engineering, Barcelona). He has been involved in an extended range of numerical models related to groundwater since 2002, when he started to work in Amphos 21. This work has been funded by POSIVA. Amphos 21 wants to thank Petteri Pitkänen and Lasse Koskinen for their support and very helpful comments. 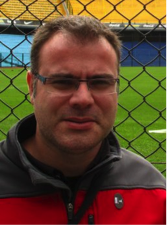 Miguel Luna also wants to thank the coauthors of this work: Paolo Trinchero and Jorge Molinero.